Accidents can – and will – happen! Knowing what action to take when they do could help save your tooth. If you ever experience one of the dental emergencies listed below, take note of the information listed here, and contact the Apple Dental team as soon as possible for emergency advice and treatment. A lost filling or crown can be painful, because your exposed tooth tissue is often very sensitive. Contact Apple Dental as soon as you can, as your remaining tooth won’t be as strong without its filling or crown. If you find your lost crown, put it in a safe place and bring it in with you. While we may be able to re-fit the old crown, your tooth may have changed shape due to decay, which means we may have to prepare the tooth again to ensure a good fit. If you’ve lost a filling, the Apple Dental team will remove any new tooth decay and place a new filling. Because toothache can be a sign of an underlying problem with your dental health, we recommend you contact Apple Dental centre straight away for an emergency appointment. In the meantime, gently rinse and floss the area to keep it clean. Do not place aspirin or any other painkiller directly against your gums or the aching tooth. Instead, take normal over-the-counter pain relief such as Panadol to relieve pain until your appointment. If you begin to feel nauseous, suffer a fever, or experience swelling, you should urgently attend our practice or your closest hospital emergency centre. Our first priority will be to ease your severe toothache pain to ensure your comfort. We will then diagnose your underlying problem, whether it is tooth decay, dental infection, or damage to your tooth’s nerve, and address it with the appropriate treatment option. You may have a dental abscess if you feel sudden, very severe pain, either in the area between your gum and tooth, or around the tooth root. This is a serious and potentially dangerous problem, which can be brought on by trauma to your tooth, periodontal disease or severe tooth decay, resulting in a bacterial infection of your tooth root. 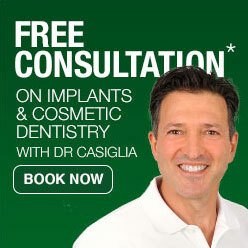 In this case, we recommend you urgently contact us at Apple Dental Lane Cove for emergency treatment. If left untreated, the infection which has caused your abscess may spread further into your body, causing dangerous complications. Gently attempt to dislodge the object using dental floss. Never use a sharp instrument on your soft gums. If dental floss is ineffective, contact Apple Dental for advice or an appointment. Take care to only hold your tooth by its crown. Rinse off the tooth root in water, but don’t scrub or remove any attached tissue. If you can, gently insert and hold the tooth in its socket, taking care to ensure the tooth is the right way around. If you can’t re-set the tooth, place it in a cup of milk or wrap it in Glad Wrap and contact Apple Dental as soon as possible. If you have pain which makes chewing difficult, bad breath, or an ongoing bad taste in your mouth, it could be a sign that your wisdom teeth are impacted, or infected. If this is the case for you, we recommend contacting the Apple Dental team as soon as possible to arrange a detailed examination. While you wait for your appointment, rinse your mouth carefully with salt water and gently brush the problem teeth, to ensure the area is as clean as possible. Try to control the swelling by applying a cold compress, and contact Apple Dental or your hospital’s emergency department immediately. Clean the area by rinsing your mouth with warm water, and hold a cold compress on the area to relieve any swelling. Call the Apple Dental team on (02) 9420 5050 immediately for urgent treatment.